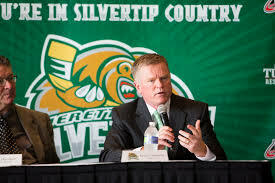 The Everett Silvertips will raise two banners into the rafters at XFINITY Arena when the 2017-18 regular-season opens.However, Kevin Constantine, the head coach who was behind the bench as the team finished atop the Western Conference and U.S. Division, won’t be there. of the WHL's Everett Silvertips. The Silvertips announced Tuesday that they won’t be renewing his contract when it expires on May 31.“They just told me they weren’t going to rehire me,” Constantine told Jesse Gelenyse of the Everett Herald. “There wasn’t any discussion of (why). It was just ‘You’re not being rehired.’ It was a very short conversation.”The futures of assistant coaches Mitch Love and Brennan Sonne, and goaltending coach Shane Clifford, weren’t addressed yesterday. Their contracts also are up on May 31.Garry Davidson, the Silvertips’ general manager, said in a news release that the organization now will focus on the May 4 WHL bantam draft, then will look at hiring a head coach.The Silvertips are owned by The Monarch Corporation, a private investment company that is headquartered in Medicine Hat and is under the control of Bill Yuill, its chairman and CEO.The Silvertips just completed their 14th season in the WHL. Constantine has been the head coach for eight of those (2003-07, 2013-17).The Silvertips have never missed the WHL playoffs; they also have two 100-point regular seasons to their credit, both of them under Constantine.This season, they finished 44-16-12, for 100 points. They took out the Victoria Royals in a six-game first-round series, then were swept by the Seattle Thunderbirds. A year ago, Seattle won a second-round series from Everett in five games. In the spring of 2014, Everett lost a first-round series to Seattle in five games.Constantine’s Everett teams always have had strong defensive games — this season, the Silvertips allowed 169 goals, the best in the WHL by 29 goals. However, their offence — 229 goals — was 15th.It is believed that Everett management would like to see its team play a more wide-open game in the hopes of improving attendance.Davidson left the Portland Winterhawks — he was their director of player personnel — to take over as Everett’s general manager on Feb. 15, 2012. He hired Constantine in time for the 2013-14 season.It is evident that there were philosophical differences between Constantine and Davidson.“I think I said when I came here we were at the opposite end of the spectrum,” Davidson told Gelenyse, “so that hasn’t changed. I hoped we would grow more together (but) I don’t think we ever did very much.”Despite finishing atop the Western Conference, the Silvertips experience the lowest regular-season average attendance (4,865) in their 14 seasons. They play out of the 8,149-seat XFINITY Arena.Their average attendance peaked at 6,460 in 2006-07, but has been under 5,000 in three of the past four seasons.In looking for a coach who likes an up-tempo game you wonder if the Silvertips might consider Kyle Gustafson, who has been on the coaching staff of the Portland Winterhawks for 12 seasons, 10 as an assistant coach and two as associate coach. He has spent the brunt of that time working alongside general manager/head coach Mike Johnston, who loves that kind of game.Having worked with the Winterhawks and with being in the same division, Davidson will be quite familiar with Gustafson’s work.As a WHL head coach, Constantine, a 58-year-old native of International Falls, Minn., has 326 regular-season victories, good for 21st spot on the all-time list.Constantine also has bead-coaching experience in the NHL, with the San Jose Sharks, Pittsburgh Penguins and New Jersey Devils.There now are two WHL teams without head coaches.The Spokane Chiefs announced on March 30 that Don Nachbaur, the third-winningest head coach in WHL history, was being relieved of his duties. Nachbaur had one year left on his contract.Gelenyse’s complete story is right here.